A must do outdoor activity on Gold Coast !! 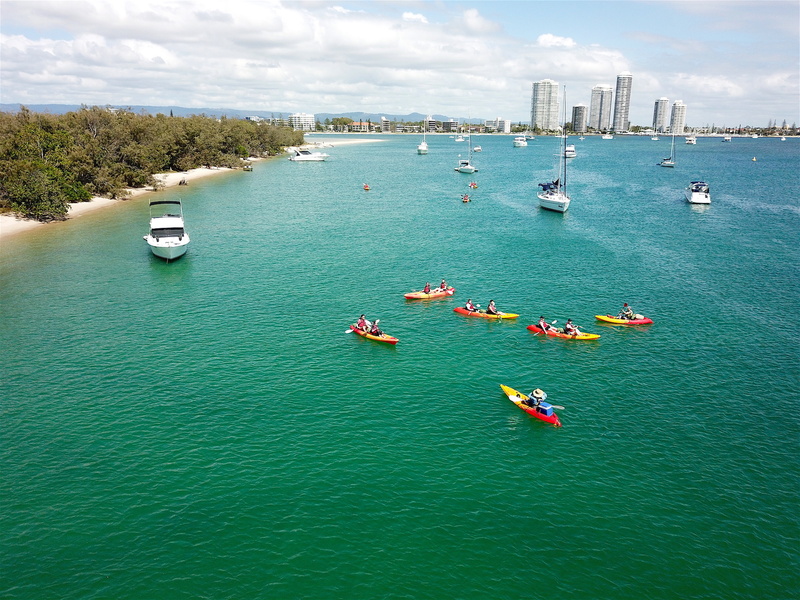 This photos shows an amazing aerial view of a group of customers enjoying the most beautiful scenery of The Gold Coast while Kayaking and relaxing under the perfect Queensland weather. 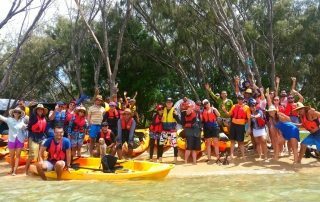 Come and try the best outdoor activity of The Gold Coast with the #1 Kayaking Company of TripAdvisor. Keep the adventure alive, Join us!! 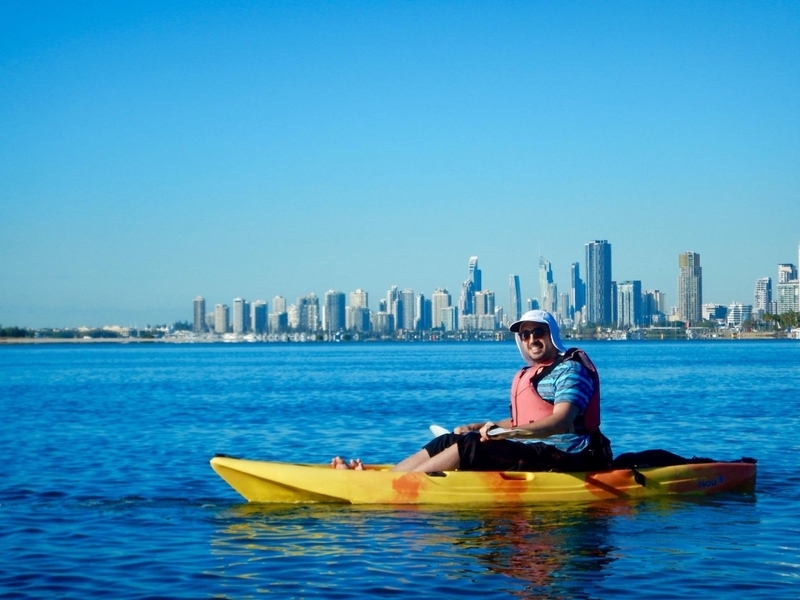 This photo shows the stunning view of Surfers Paradise that you can get when kayaking around the Broadwater. Join us and discover The Gold Coast like never before! Stunning aerial view of one of our kayaking adventures. This amazing photo shows how beautiful is the area where we run our tours. Join us and keep the adventure alive!! 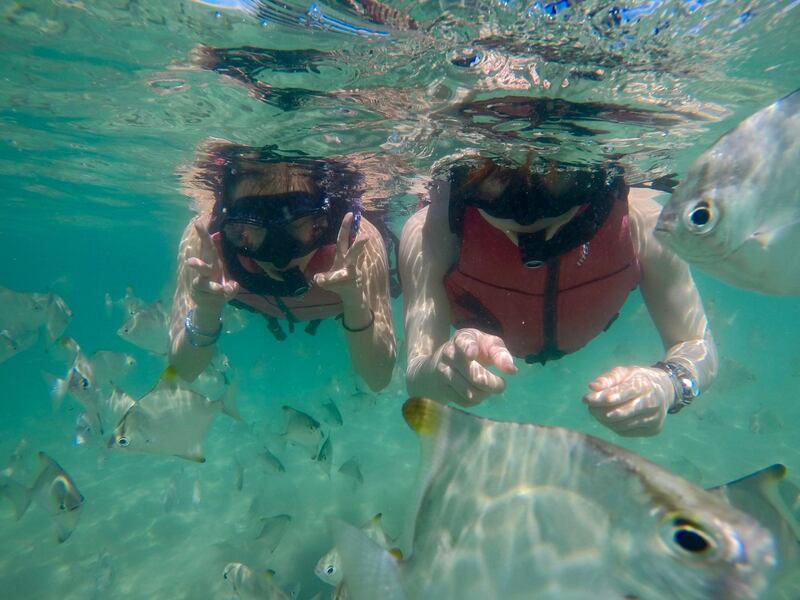 Explore Gold Coast’s underwater life! 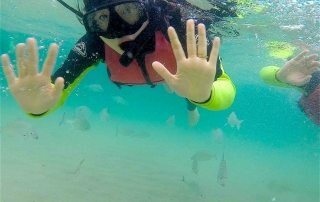 Come and join us discovering Gold Coast’s underwater life while having fun. 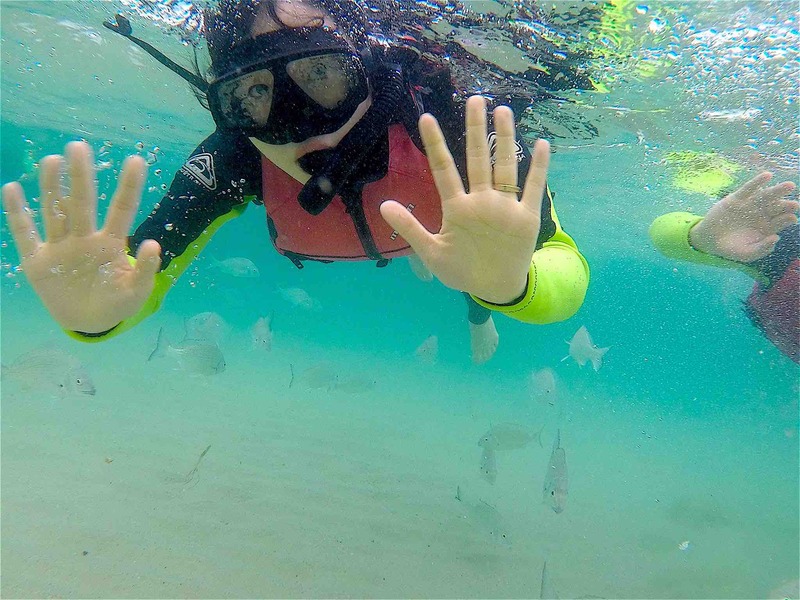 Snorkeling at Wave Break Island’s reef is a must do activity in Gold Coast. 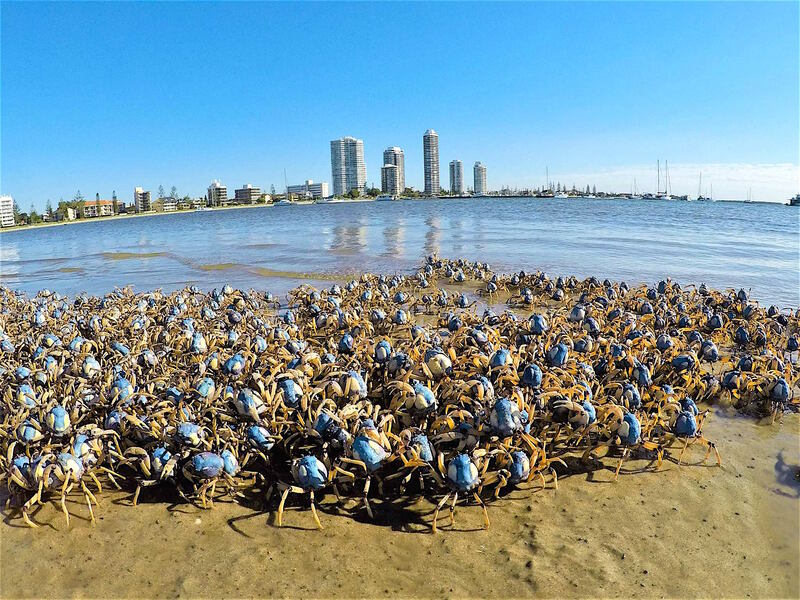 This photo shows the moment when we found hundreds of soldier crabs chasing the tide. We normally spot them every time the tide is dropping and they produce an amazing sound when moving all together. 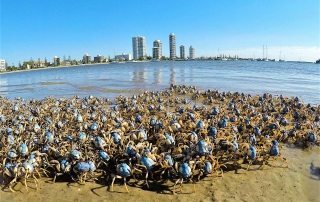 This sound is similar to the sound of a big troop of soldiers walking all together and for this reason their name “Soldier Crabs”. Join us and experience animal encounters with us. Keep the adventure alive! The Gold Coast is famous for its pristine beaches, sophisticated sky-scrappers, and theme parks. However, there is so much more to it. 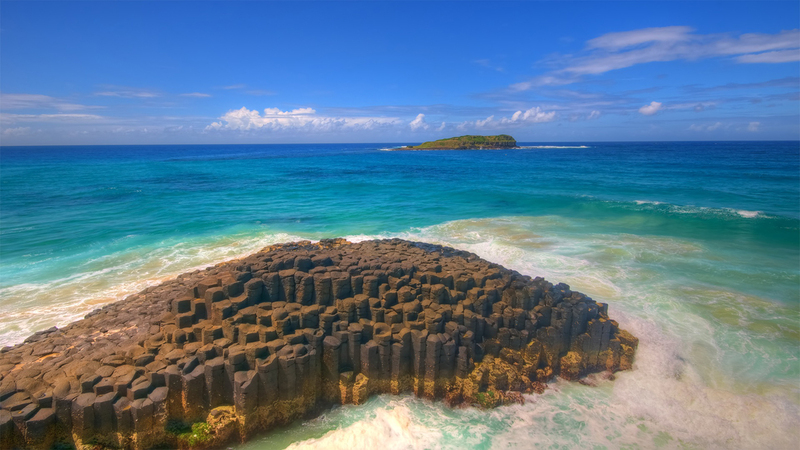 From the hinterlands to its waterways, it will amaze you with its breathtaking landscapes. 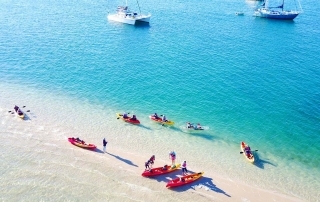 An excellent way to explore the Gold Coast to its fullest is by kayak. 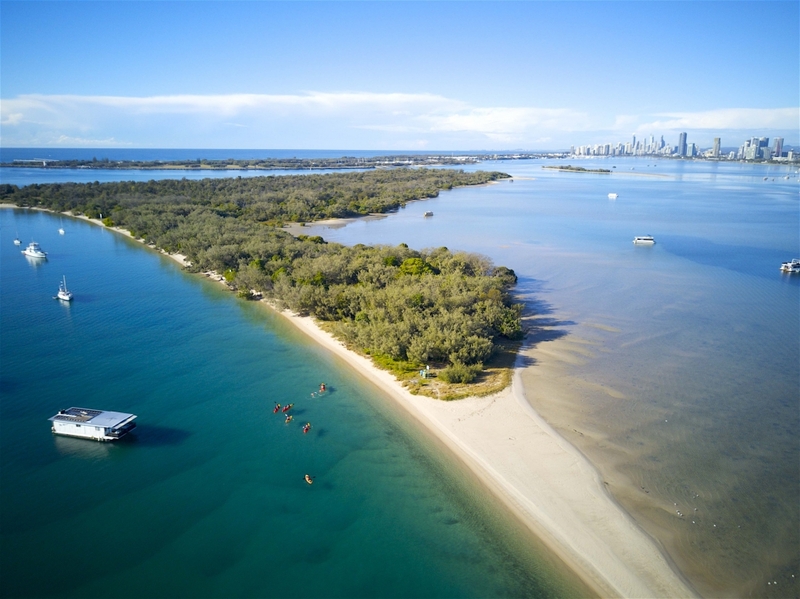 Environmentally friendly, health-improver, and easy-to-do, kayaking will give you the benefits of exploring the Gold Coast’s hidden gems, whilst giving you the satisfaction of reaching these secluded destinations on your own. And the best of all, you get to be in direct contact with nature throughout the journey. 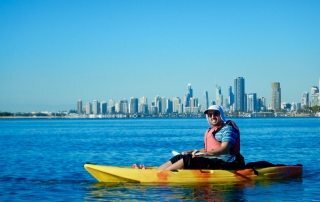 A great company to kayak around the Gold Coast is Seaway Kayaking Tours. They offer a great variety of kayaking tours throughout the city aimed at allowing their customers to explore these so mentioned hidden treasures. One of the places to visit is Hinze Dam. Buried in the Gold Coast hinterlands, this majestic place is a must. There is no better way to explore the dam than to paddle along the city’s main drinking water supply, being able to experience its peacefulness and greatness from within. Seaway Kayaking Tours and their Hinze Dam Adventure tour allows you to do so. Running from the Springbrook Plateau all the way to the southern slopes of Burleigh Head National Park, leading to the Pacific Ocean, you can find the beautiful mangrove landscapes of Tallebudgera Creek, another stunning Gold Coast gem. Famous for its fishing, there is no better way to explore this creek than kayaking, and you can also do so with Seaway Kayaking Tours and their 3 Adventures in 1 Day tour. 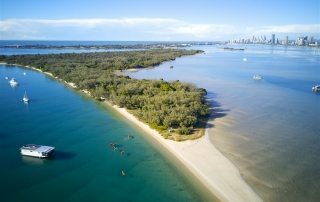 Towards the North of the city, the Gold Coast Broadwater represents a must for kayaking aficionados. 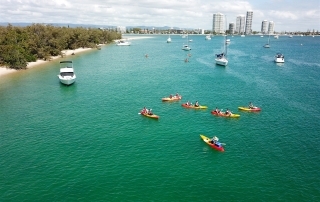 With a large community of dolphins living around it, stingrays, soldier craps, pelicans, among other beautiful fauna, paddling along the Broadwater allows you to become a part of nature, and experience the Gold Coast from a different perspective, escaping the hustle and bustle of the city. 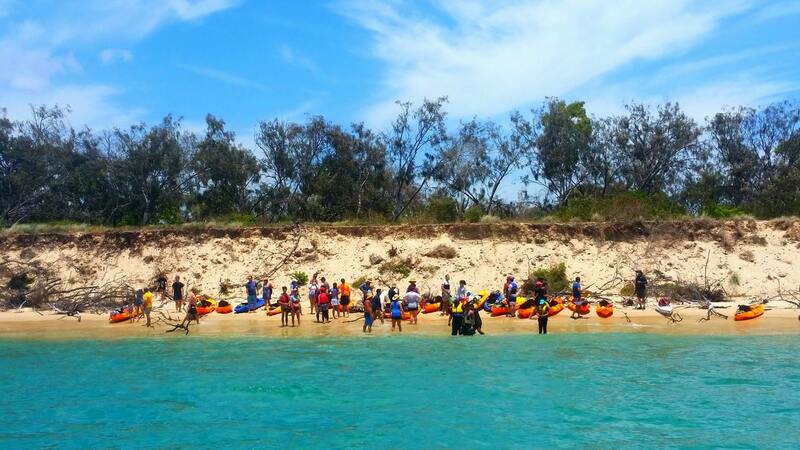 About a 40-minute paddle from Marine Parade, Biggera Waters, you can reach South Stradbroke Island. Home to the iconic Golden Wallaby, South Straddie is one of the world’s purest and largest sand Islands with 22 Kms of beautiful pristine white sand beach, without a doubt one of the Gold Coast’s hidden gem. Finally, Wave Break Island represents an incredible destination for first-time kayakers. 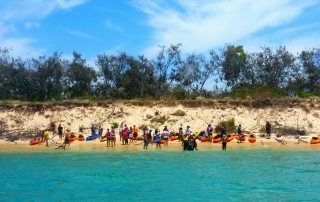 Only a 15-20 minute paddle, this stunning man-made Island was built to protect the western shore and is now home to many iconic Australian animals. From this Island you can admire a unique view of Gold Coast city. 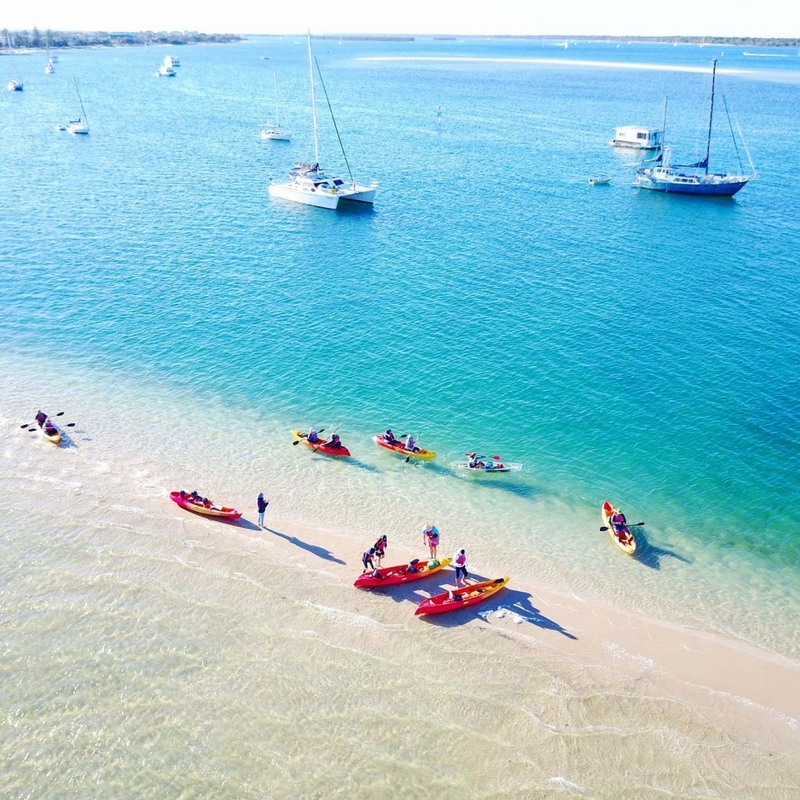 The Quick Escape, Paradise Break and Chill-Out tours from Seaway Kayaking Tours are designed to explore the Broadwater and its Islands to their fullest. They also offer kayak rentals on the area. Explore Gold Coast with us! 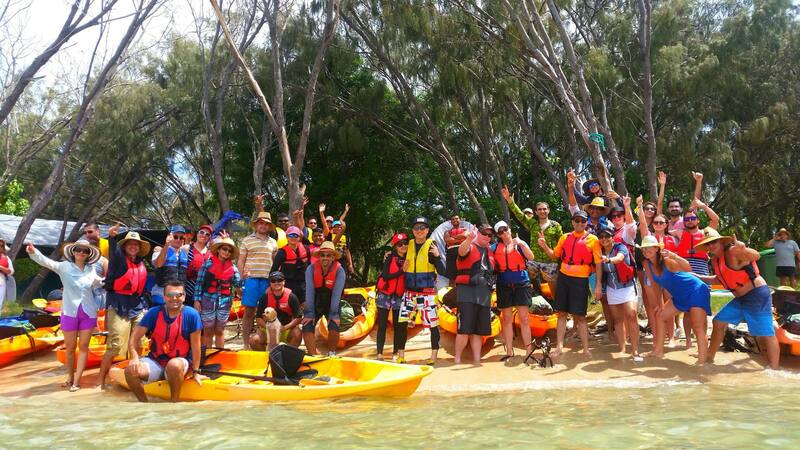 Group of customers having a blast while exploring Wave break Island. Keep the adventure alive, join us! 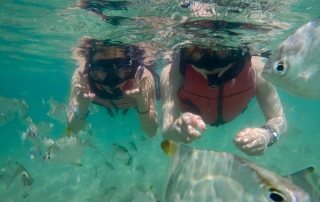 Come and snorkel around Wave Break and South Stradbroke island with us to discover the amazing Gold Coast’s marine life.